ATLANT is a result of significant scientific and practical experience accumulated of over 20 years of work. 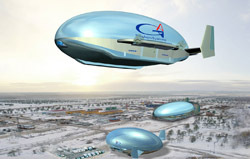 This innovative aircraft combine the best properties of the airship, plane, helicopter and hovercraft. 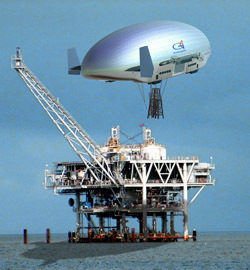 This approach allows to get rid of the traditional disadvantages of this mode of transport and preserve the unique advantages of airships - a longer range and lifting capacity, economic and environmental efficiency. We develop the size spectrum of ATLANT aircrafts with the lifting capacity of 15, 60 and 170 tons and flight range from 1500 to 5000 km. According to preliminary estimation the transportation costs will be in the range of 7 to 25 rubles for ton-km. 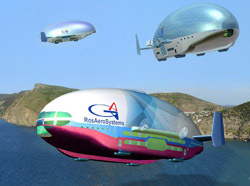 ATLANT aircrafts can be used for medium and short range distribution logistic to connect existing transport hubs with the remote regions, as well as for long-haul transportation with the possibility of door-to-door transportation including unprepared sites and water surface. The ATLANT military cargo delivery deserves special attention. This unique transport aircraft fully corresponds to the new mobile army conception and create new possibilities of mobile radar surveillance, air defense and missile defense, as well as assault command moving and creation of airmobile control points. ATLANT passenger version will be able to offer new standards of comfort and safety of air travel. 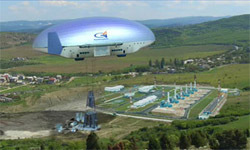 To accelerate the reclaiming of the unique remote mineral deposits with the minimal environment damage. To increase the export potential of the domestic aviation industry due to aircraft export deliveries. ATLANT will bring not only the direct economic benefit but also will became the unique environmentally friendly transport: operation of each such aircraft instead of the traditional cargo aviation will save about 50 tons of fuel and the atmosphere will save more than 100 tons of oxygen!